Nvidia has been on a tear introducing new graphics cards – in recent months we've seen the GTX 1080, and the surprisingly powerful GTX 1060. And now it's delivered the fastest gaming graphics card on the planet – although not surprisingly it doesn't come cheap. Nvidia has announced its next-generation Titan X, featuring 3,584 CUDA cores operating at 1.53GHz – that's a big step up from the 1.08GHz 1,072 CUDA cores found in the last-gen Titan X. Equipped with 12GB of the latest GDDR5X memory and 12 billion transistors, the Titan runs at a blistering 11 teraflops. The graphics card maker claims the new card is 60% faster than the last-generation Titan X. However, it'll take a decent chunk out of your wallet with a price tag of $1,200 (about £905, AU$1,605) for the Founders Edition and only edition available direct from Nvidia. 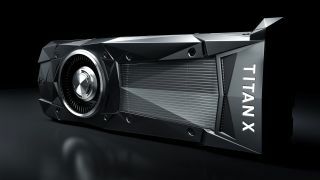 The Nvidia Titan X is released on August 2, and you can bet we'll be reviewing this bad boy soon.